Home Politics Bengal Polls Will Bengal’s nefarious syndicate raj come to bite Trinamool? Will Bengal's nefarious syndicate raj hurt TMC? 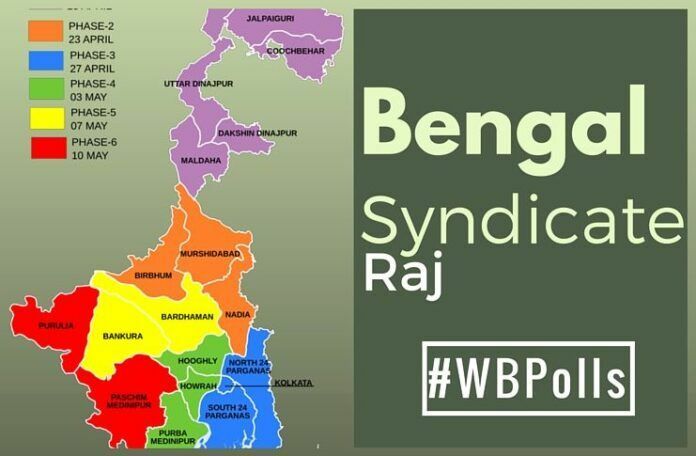 [dropcap color=”#008040″ boxed=”yes” boxed_radius=”8px” class=”” id=””]B[/dropcap]asically explained, ‘syndicate’ means in West Bengal means a group of persons banding together to promote a common interest; but in West Bengal, ‘syndicate’ not only dominates the economic aspect but is becoming a major political issue in the poll-bound state. Experiencing political patronage, these cartels of muscle- youth that was flexing, are thought to power companies and supporters to buy design components frequently of poor quality at high costs. It’s not merely cement or the brick, even yet in choosing a legitimate specialist for procedural formalities or even a priest for doing the “pujan”, the syndicates have the last word. From the neighbouring Bidhannagar to the professional belt of Asansol in the city, these syndicates have already been mushrooming large and even and across the Calcutta High Court indicated its issue over the “syndicate raj”, going out that it has not spared even the judiciary. [dropcap color=”#008040″ boxed=”yes” boxed_radius=”8px” class=”” id=””]W[/dropcap]hile the accusations of political patronage for syndicates are mostly fond of the ruling Trinamool Congress (TMC), the Communist Party of India-Marxist-led Left-Front has additionally faced similar accusations towards the end of its 34-year long stint. In fact, in the early years of the last decade, when then state housing minister Gautam Deb announced plans to acquire large tracts of land in the city’s north eastern fringes to set up the sprawling Newtown-Rajarhat township, it was decided that the land losers would form co-operatives for supplying building materials to the new land owners. Gradually, these co-operatives became powerful as muscle and money added to their growing influence in the localities. Such is their clout now, that even local problems like landlord-tenant disputes or quarrels regarding road tap water queues are handled by syndicate heads. The Trinamool has landed into a mess following party MLA Sabyasachi Dutta’s candid admission of the “flourishing syndicate raj”. [dropcap color=”#008040″ boxed=”yes” boxed_radius=”8px” class=”” id=””]A[/dropcap]lready reeling under the Narada issue – a sting operation by a portal showing several of key Trinamool leaders taking bribe — and the recent flyover collapse that killed 26 people, the Trinamool is now at the receiving end of the opposition. Prime Minister Narendra Modi, during a rally, said the TMC stands for “Terror”, “Maut” (death) and “Corruption”. Two days after Dutta was caught in a sting in which he admitted how the “Rs.50 lakh to Rs.60 lakh required to fight the polls comes mostly from the syndicates”, Modi while campaigning in the state, tore into the Trinamool, saying “maut (death) and money have replaced the (TMC) slogan of “Maa Maati Manush (mother, land, people)”. While the opposition – the CPI-M-led Left Front, the Congress and the BJP have been raising the syndicate issue time and again, Modi’s raising the issue has set the political temperatures soaring. It’s not just in the poll season. The syndicates have been in the news for a long time with their highly lucrative business often alleged to be the major cause of factional feuds within the Trinamool. [dropcap color=”#008040″ boxed=”yes” boxed_radius=”8px” class=”” id=””]W[/dropcap]ith Bidhannagar and New Town being the hotbed of these syndicates, clashes allegedly between followers of Dutta and those of Bidhannagar’s Trinamool MLA, Sujit Bose – have often been reported. There have also been several shoot-outs and murders involving members of the syndicates. In fact, during her address to party supporters at a rally in the city, Banerjee sent out a strong message – asking them to choose between syndicates and the party. West Bengal assembly elections are being held in six phases. The first phase was on April 4, the second is due on Monday.